Score! Hero, from the award winning makers of Score! World Goals, Dream League Soccer & First Touch Soccer. Score! Hero is a sports game where, instead of controlling an entire team, you can only control one player. Also, instead of playing the entire match, you only participate in a number of key plays in each match. Score! 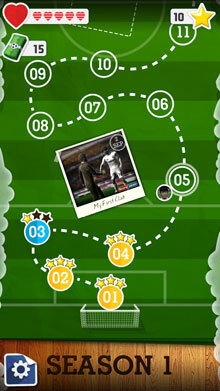 Hero – build a career in the professional football. Win championships and tournaments. Ger a collection of trophies and other awards. In this game for Android you can create a unique football player, choosing appearance, shape, etc. Start your career in a little-known club. Play against different opponents and lead your team to victory. Make assists, score goals, do corner and free kicks. Improve your skills and rating. Transfer to other football clubs. Become a football legend. BE A HERO! Pass, Shoot & Score your way to legendary status, as you explore the dramatic career of your HERO player over 400 challenging levels! – Hero Bux can be earned during gameplay or gained by watching videos, but can also be bought in packs ranging from $0.99 – $29.99. – This game is free to play, but additional content and in-game items may be purchased for real money. – This app contains third party advertising. Advertising is disabled if you purchase in game currency from the shop. – This app uses wifi or mobile data (if available) to download game content and advertising. You can disable mobile data usage on this game from within Settings/Mobile Data. Game Score! Hero is a very entertaining soccer game with great graphics. It offers a different gaming experience from other soccer games. In addition, the game has tons of customization options for your player.